They arrived ready to hunt … deer-antler slingshots made by their uncle at the ready. They were cousins, and their fathers were hunting with me at a local preserve, our annual “vamos a caza” day. My friends Nato and Franki grew up hunting in rural Mexico, first with their own slingshots, then firearms, and today with my shotguns while I handled dogs. 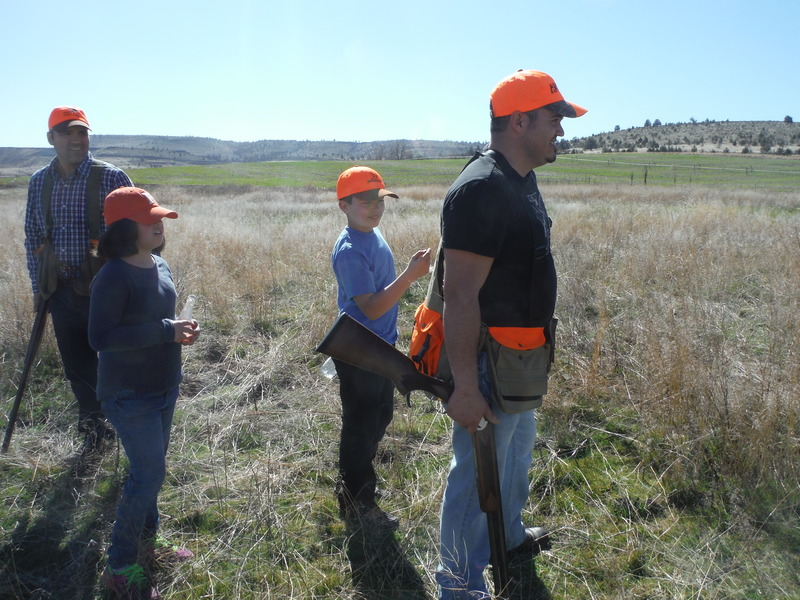 Do children belong on a hunting trip? Short answer: maybe. Long answer, below. Geraldo, age 10, and Venezia, age nine, had the look that most kids have when they pile out of the car in the Disneyland parking lot. Their excitement was tempered by good manners, with handshakes all around and an eagerness to meet my dogs Manny and Buddy. Theirbarely-contained energy was contagious, and a long drive did nothing to diminish it. Questions and jokes shortened the journey. Though they would be spectators today, these kids had a healthy respect for firearms thanks to their fathers’ careful instruction. A few rehearsals on who-stands-where-when, and Manny’s lead was unclipped. Fathers in front, kids with me, it wasn’t long before Manny’s tail twitched then stopped, and my earlier explanation of pointing suddenly became relevant. Bird up! A quick shot by each brother and the pheasant was long gone. Laughs, hand claps and more questions: “Why is the gun so loud? Where did the bird go? How does Manny know what kind of bird it is?” Each was answered patiently as we moved, our group amoeba-like, toward Manny, frozen in the milo. The brothers walked up the bird, waited a half-second longer this time, and the bird dropped. Glory was shared by both shooters, while a new level of curiosity about bird and shot was kindled as the retrieve was completed. Close-up looks, fingertip touches, even a delicate sniff to see what a dog knew that they didn’t – it was a classroom in the field. The brothers walked ahead, sharing time in a way they hadn’t since our last trip. The cousins found empty shells of all the colors of the rainbow, doing their best to clean up and be good guests. Stories about those who made the red-yellow-green-purple hulls turned the walk into an adventure. The red ones made by a company also makes rockets … the green ones came from a company that made guns for Buffalo Bill … some were even true. All their intent looking yielded other treasures. Thundereggs, a translucent quartz, what might have been an arrowhead. Each was oohed and aahed over, then carefully stored in a pocket. There was never a whine or gripe, no complaints about being too hot or hungry … these were children you would gladly claim as your own. Maybe you’ve taken kids hunting. Maybe you’ve had a different experience than this. Maybe I just got lucky. I handle my dogs at youth hunt clinics every year and it’s a lot of fun watching kids hunt for the first time. Even if a kid doesn’t hit a thing, they love that first experience.